Summer is in full swing! This means for most, kids are out of school and schedules change into a different mode. Mornings can be a little chaotic in the kitchen with all four of my kids trying to get their breakfast. Of course, they’re ravenous (always) because they haven’t eaten in 12 hours, so ya know, it’s all about them getting food. 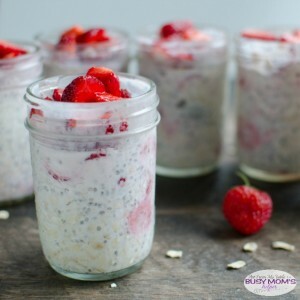 That’s why I love these Strawberry Almond Overnight Oats! It’s the perfect grab ‘n go breakfast, even if you’re eating at home! The oats are prepped the night before, so all they have to do is grab a jar and a spoon and enjoy! Everyone in our family loves these. If you are headed off to work in the morning, it’s perfect to take with you as your breakfast or even a fabulous nutritional mid-morning snack that will keep you energized. I live in a 4 season climate. Summer, specifically June is peak time for strawberries. There is just nothing like farm fresh, straight from the bush, strawberries (and blueberries, cherries, etc). That is why I chose Strawberry Almond Overnight Oats, but, these are so versatile that the flavor combinations are endless! After this, you add your fruit and flavorings. For this recipe, I added a 1/4 tsp almond extract and sliced strawberries. Cover it again, shake it up and let it set in the fridge to do it’s magic! I typically add a little more fresh fruit to top it off in the morning, but totally not necessary if you don’t want the hassle. So this recipe, really doesn’t take much time at all to make. I’ve given you the measurements for 1 pint sized jar. I just line up the how many jars I need and add the ingredients to each. The kids love making these too. Sometimes in the afternoon, we’ll make them together, for the next day. Truvia is my sweetener of choice to make it friendly for the whole family. Some of us can’t have sugar. You can also use honey, or use vanilla yogurt instead of plain and skip the sweetener all together. Regular milk works just as good as any nut milk, so don’t let that ingredient keep you from trying it. Always shake it before adding your fruit, it will blend together much easier. Give it another shake after adding the fruit, or just stir. Place the oats, yogurt, sweetener, chia seeds, almond extract, and milk in a pint size mason jar. Cover and shake vigorously until ingredients are well combined. Add fruit, cover and shake again to mix it in. Place in the refrigerator overnight. In the morning, the mixture will be thick.